Absolutely false. JY's limitations have been exposed after his century against England - on both sides of the ball. And given that Ashwin is in the side, playing a second off-spinner, and a limited 'support' one at that, makes zero sense. Nobody's arguing against the fact that Pandya is not quite the finished product as far as test allrounder is concerned. He's way short. But he's the best of that type available for Team India selection. And given the test squad in question, his selection has reasonable merit - merit that should be acknowledged even if you disagree with his selection. There's no merit of playing Pandya in Subcontinental tests. Aswin and Jadeja can contribute with bat. We can play an Kuldeep Yadav to develop him. It's unfortunate that Pandya is a sure starter in Tests for India even though he has proved so little. Who is arguing for him to play in subcon tests unless as a prelude to a tour to SA/Eng? Nobody. Heck if Bhuvi was fit, I'd be arguing against him playing in the 1st choice XI even in England. If we had Karthik, Ash and Bhuvi at 6, 7 and 8, he'd be running drinks. There are many Pandya fans. Kohli and his Team management are the biggest one. I am against of the fact that Pandya is a sure starter in the team, which he shouldn't be. Wouldn't have played him if Bhuvi wasn't unfit. Well that's a bit of a walkback from your previous foaming at the mouth post. But fine. I spoke as a general case. I had even written in that post. Pandya should play since Bhuvi isn't there. Infact England faced this problem in Ashes with Moeen Ali who is infact a much better batsman/bowler than Pandya. He ruined their balance because he was not good enough against short pitch stuff and Lyon was outbowling him. England would have done better w﻿ith an out and out specialist. Sometimes playing an allrounder just for the sake of it won't help. Just saw this, and have to call out a false causation. England could afford to drop Mo because they already had 2 bonafide stud allrounders in Stokes and Bairstow. If England had Ben Foakes keeping wicket for them, and no Stokes, you'd bet your bottom Pound that they would fit Moeen Ali in their XI. At Lords, they are likely to, in spite of Sam Curran and Chris Woakes offering plenty of batting depth in the XI. Shameful thread. Scapegoating a rookie all rounder with bags of potential and has shown ability to fight while there are 'specialist' batsmen averaging low 20s and teens away from home on a consistent basis. We still don't have. Gavaskar just confirmed it. And you agree with everything Gavaskar has to say about cricket? Completely agree with Op.I would not even pick him for ODIs.do you trust a chase with this guy? The answer in NO. But why play an extra bowler? 5th specialist bowler isn't needed at all. No team plays with five specialist bowlers. Test cricket is a game of four bowlers. We don't need a Kapil Dev. We need a Symonds type batsman who can bowl a bit which Pandya does. Regarding defense, you must have missed his batting in second innings. It was assured as Kohli's. Not at all. All he said and I agree is that in 100 years India just had one allrounder. I think I said that one year back. If he agrees with me I am not going to dispute that. This is what happens when you don't watch cricket. What are you talking about he has decent defense.You can score 90 in SA with out Defense.He looked better defensively than most top order batsman last test. Secondly he has a good Inswinger,He had few good spells in SA. We don't need a Kapil Dev. We need a Symonds ﻿type batsman who can bowl a bit which Pandya does. Symonds type of batsman is only good for interim period and not a long term prospect for test cricket. Symonds type of allrounder is very good for ODIs and T20Is without a doubt but in test cricket, such a guy is just OK in tests but I would like to replace him in the long run with either a proper batsman or bowling allrounder. I really wished that it was as assured as Kohli's. If he would have taken us through the finish line, I don't think anyone on ICF would have disagreed with your line there. I know it is just one innings and a batsman can get out any time, still I did not feel that he had it in him to take us there when the eventual dismissal happened. I wished that he did it and his image and our trust in him would be at a different level. Pandya plays as a 6th batsman. Why are you ignoring this. Already has a 100 and a 70 odd in SC test matches. Who you want to play in his place in SC? If he had someone to support who knows he could have done that. Bunny and Lal average 22-23 with the bat with 5 50s and 0 100. @The Outsider, it is really awesome to see you posting on the forum. Miss those days of fights between you and @BossBhai. I think Pandya will surpass Ronnie Irani and Abid Ali, but fall a bit short of Madan Lal, with a bit of role reversal in that Pandya's batting will be the relatively stronger suite. A trend which Dhoni started continues to destroy the end performance. Process was more important under Dhoni. Seems even now there is so much emphasis on just the process and lack of accountability which continues to produce bad results. The approach is very casual than result oriented. Witha losers mentality that it is just about process and not about results more away series loses are bound to happen. Hey, wait for the home test series and IPL. Rohit will call Steyn and Co. to bowl to our players in India and someone else will ask Sam Curran to come to India. That should solve the woes. South Africa series was lost 2-1. Not that it was a shocker, it was well expected. Here too in England, the team is looking at another series defeat being on backfoot staring at results of 0-1. As long as batsmen just turn up to take a stance and do fielding for both innings, it has become immaterial that they average below 10, below 21. The same show which was showcased to fans in SA needs to be showcased here. As long as all-rounder has bowling SR of 88 it is fine because he is used for rotating the bowlers and rest them. new definitions, you know !! Let the wicket-keeper drop few catches. All well because he is doing the process of getting down and up ball after ball. So fine whatever the end results are, he tried. If everything is fine then where are the series win, where are the positive results ? Why are negative results being accepted ? Has the losers mentality fully sulked into the team processes ? IS there any accountability at all at international level sport where results are more important ? Or is it the weekend club level cricket? Batting karo, fielding karo, bowling karo. Haar to khel me hoti rehti hai. a role that the team desperately needs. I am sort of ready to wait and see whether Pandya will be able to justify his place in the XI. Howewer I dont agree with this part. Our team of 2002-2010 did quite well with 6 batsmen and 3/2 pacers 1/2 spinners. ATG Australia of 95-05 did well without an all rounder too. We don't desperately need an AR. 6 solid batsmen with 4 proper bowlers( all of them wicket takers) are good enough for a team to do well. Do you feel Pandya is good enough to play as a pure batsman in tests ? When did we actually get results overseas against top teams? we have never won a series in Aus-SA. and you may not agree but Pandya is as good any batsman you will play at 6. ATG Aus had someone like steve waugh, mark waugh, lehman, symonds to bowl a few overs. even indian team of had SRT, Viru, Ganguly who were decent bowlers. Of course. He is a batsman who can bowl a few overs right now and overtime, his bowling will get better. It is useless to play 5th bowler because 5th bowler is always under bowled like Pandya himself has been. And then you do need someone who can bowl a few overs and could also pick up a wicket or two and he fits the bill. He is certainly better than bits and pieces Ronnie Irani . Yup, in test format i think his batting average will remain better than that of Madan Lal and bowling average of Abdul Razzak if he works very hard on his bowling. Jadeja is a better bet than pandya. 3 proper Pacers and two spinners will be ideal. Pandua's bowling is ineffective. Both jadeja and pandya are unreliable with bat. Jadeja makes it up on the field. If the pitch is really dry, then Kuldeep is an option. we dont need a specialist 5th bowler. we need a batsman who can bowl a few. Pandya does that. Can you tell me which batsman is reliable in this team accept Kohli to some extent? 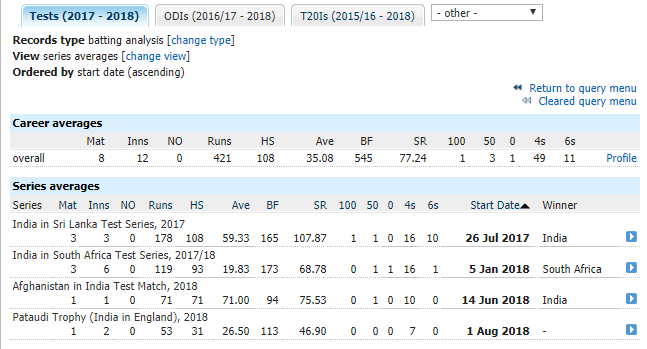 you want to drop your second best batsman? In my opinion he will have to improve by some margin to be a proper no. 6. He was sent at no. 8 just last innings. If his batting average remains in 30-35 range he isn't the right choice. he was sent at 8 because Ashwin was sent as night watchman. Rahane also batted at 6 and not his usual 5. Gavaskar also said he will play Pandya. He did not say Pandya should be dropped. One thing for sure is we can not tag Pandya as an all-rounder in Test cricket. His bowling is almost non-existent and expendable. A bowling average of 45 with a SR of 88 is beyond pathetic. Then if he's there as a batsman, is he really the best we have got in the country at 6/7? We need an additional bowler as we cannot depend on dollies to take wickets in Test cricket. But you see "some experts" will tell you that an A/R is a relief bowler, who's not expected to take wickets, but will eventually get them if he's bowled (long) enough. England and India will be tempted to play two spinners in the second Test as a heat wave continues to sweep through London. With temperatures hitting the mid-thirties consistently, the challenge for the Lord's groundstaff has been to ensure there is enough moisture in the pitch to produce an even contest. ESPNcricinfo understands this summer has been the most difficult ever at Lord's. The closest they had come to fighting against such oppressive heat was in 1976, but that match between England and West Indies was played a lot earlier, in mid-June. Surely Mick Hunt, the head groundsman who retires at the end of this season, would have like more helpful conditions for this farewell Test. The surface remained under hover cover all through Monday to protect it from the relentless sun, but there is some reason to be optimistic. The mercury is set to slide down into the early twenties from Thursday and weather turning much cooler. Pundits already believe both India and England - who begin training on Tuesday - may be thinking of playing an extra spinner. England's white-ball captain Eoin Morgan, who also leads the local county side Middlesex, reckoned conditions are likely to have "quite a significant" effect on the pitch. "Lord's is a ground with a magnificent pitch, but with the way the weather has been, it is so difficult to keep the moisture not only in the pitch but actually in the square," Morgan said. "I think it will be quite similar to Edgbaston. You will have to assume it will turn and probably reverse swing will play a big part as well." Later, when asked to put on the England selector's hat, Morgan chuckled and said: "I think you will have to consider two spinners. Everybody was surprised that both sides didn't go in with two spinners in the last game which probably took India away what naturally comes to them. At home they play two spinners. Both sides will look to play two spinners." Former India offspinner Harbhajan Singh was of a similar mind. "India made a mistake even at Edgbaston going with one spinner. They could have gone with Kuldeep Yadav instead of Hardik Pandya even at Edgbaston, where the conditions were dry, the wicket was dry, where you know the sun is going to be out. So, India, they didn't read the conditions well. They went ahead choosing four fast bowlers and one spinner which didn't help them. Though they bowled beautifully, all seamers, but Hardik Pandya didn't bowl and didn't bat as the team wanted him to. So why play him?" Harbhajan then explained why he would choose Kuldeep over Pandya or Ravindra Jadeja at Lord's. "He will create chances. He bowls googlies, legspin with the left hand. On the first day, suppose India were to lose the toss and they are still bowling (at the end of the day), this guy will create chances on a good track. Right hander or left-hander, Kuldeep is the guy because he (can) spin the ball both ways"
Former England captain Nasser Hussain, however, was less convinced. "Historically, it is not a ground I would go to and play two spinners. You look up at the Honours Board in both dressing rooms, there's the odd occasion, Swann I think, where spin plays a massive role. Shane Warne never got five wickets here." Hussain suggested that India - more than England - would be contemplating the idea of playing two spinners, provided it didn't disrupt the "balance" of their XI. "Just with the summer you are having there is a good argument to say if you can balance your side still to get two spinners in. India might. Now they [England] have got more right-handers and if [Ollie] Pope and [Chris] Woakesplay, you may want someone spinning it the other way, whether it be Jadeja or Kuldeep bowling his variations with a bit of mystery about it. So I would be more prone to India saying we will play two spinners than England." Asked if would field both Moeen Ali and Adil Rashid at Lord's, Hussain said only if he was convinced the pitch was a "raging turner" and added he would have "actually played" Moeen ahead of Dawid Malan at Edgbaston since it wouldn't have had any impact on the balance of England batting but would have offered them another spin option. "Now that they have picked Pope I would probably have to play Pope. Unless you think it is going to be an absolute raging Bunsen, you could play one seamer less and Moeen. But it would have to be a raging turner to make that (change) because obviously lot of right-handers in the Indian side." That's a ridiculous assessment as we are not gifted with top quality blowers to waste a Test spot on Pandya and his bowling. If he's the best batsman we have got then sure get him in the team in place of a specialist batsman. But is he really the best batsman? He's a "batting A/R" - they're not supposed to score 50 or 100 in these conditions, they're just there to provide relief for the tailenders before they come out to bowl. A 20 or 30 from them is worth more than a 100 from main batters, you see as long as they avg 35 they're good, but remember that avg will be sub 30 (career avg) before the end of the series or possibly even sub 20 just for the entire series. His precise test batting career average is 35.08 . Host country-wise batting average is as follows. He started with a wonderful batting series with a healthy average of 59 against Lankans. Then in SA, his batting average declined to almost 1/3rd . Then against Afghans he took it back to a very healthy average of 71. Against England in England it is back to 1/3 rd. Host country-wise batting average is as follows. He started with a wonderful batting series with a healthy average of 59. Then in SA, his batting average declined to almost 1/3rd . Then against Afghans he took it back to a very healthy average of 71. Against England in England it is back to 1/3 rd. Well you proved my point, his batting is getting us nowhere, his bowling is just a facade, thus A/R for many on this forum. Most of the fans are getting orgasmic at the fact that he can bowl sharp at times. However, hard decisions have to be taken if we want to be known as a tough opponent. And he doesnt merit a place in countries like England or new zealand. Its got to be horses for courses. In test cricket, one needs specialists. We need a pure batsman. Do we have one in standby at the moment, who we can trust upon? I am not certain of that, however I am certain that Pandya is not the answer. Personally i observe that he is wonderful in Indian and SL conditions as a batsman (not just as an all rounder having that batting average). Those are healthy averages, even against weak bowling attacks of SL and Afghanistan. Out specialist FTB's are also similar. In comfort zone all our batsmen are 100+,150+, 200+ and even the 300 knockers. But then like in SA end up with averages less than 8 or 21. Whereas their career averages are between 40-42. Problem happens when our batsman are out of comfort zone bubble. It reduces to 1/2 or even 1/4 in some cases. Still i would consider his overall batting average of 35 as he is not a specialist batsman and he is more prone to sharp decline in batting average in tough conditions in out of comfort zone wickets / conditions. Even our specialists struggle and he sin't a specialist batsman so not fair to judge him on same benchmarks. So i would not consider his selective average of 20 like one would in case of analyzing specialist bats. Pace all rounders are rare to find in India. Not a hidden secret since ages. So we will need to invest more time in him. By that i mean if we decide a specialist batsman or bowler is worthy of long term place or not in 16 matches (which is more or less 4 series), i would take a call on AR in 5 series (say 20 tests). The onus is on the players though. Just because it is a rare commodity, it should not be a R&D on going concern. Somewhere it has to stop and like every professional setup, especially at international level and especially considering one of the member of top cricketing nation, it has to evaluated rather than throwing vague subjective terms like bowling daala, batting kiya, catch pakda. Efficiency is the key rather than kya kiya. Performance has to be delivered in terms of numbers after playing 20 tests atleast. How he gets end result is upto him. Cover the average against Afghans and SL to adjust the decline in SA and England, it's fine. End of the day the result is important. So batting is what i wont criticize with avg of 35 but bowling SR 88 is something he needs to cover against lesser opponents like he covers batting average. Pandya's only the second best batsman if one is a blind fan! If he's the second best batsman he'll be batting in the top 4. He was fortunate to face the older ball and survive slightly longer, He is not even in the top 6 batsmen in the team! He cannot bowl and Kohli has no trust in him as a bowler as proved in the second innings. He will leak runs. Had an efficient 5th bowler been available India could have suffocated England and perhaps won the game. A second spinner would have been handy. 3 pacers and 2 spinners are what India needs to beat England. He will be dropped for the second Test. You are a nice gu but you don't understand modern sports. On field captain is not the one who knows. This is another discussion. Will he give rest to other bowlers/ Will he sing a lullaby? If not these Pandya boys don't want him.